The transition to new manufacturing processes in Europe and the U.S. from the late 1760’s to 1840’s – the industrial revolution – brought many changes to the lives of the working class. Prior to the revolution, the majority of the workforce were in the agricultural business, but as the cities and factories grew, many of them left for urban areas. The factories had to produce their products 24/7, therefore it was expected that the employees would work fourteen to sixteen hours a day. Wages were dismal, especially for women and children. 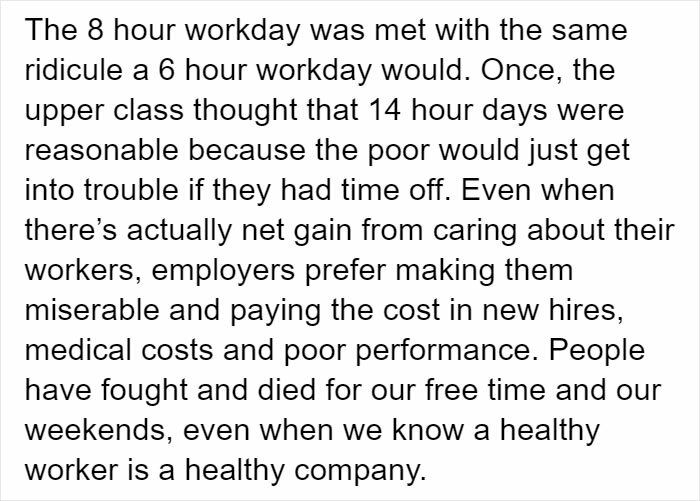 Workers had only one day off a week. The workday of eight hours didn’t become common until the early 20th century, thanks to activists who introduced “Eight hours labor, eight hours recreation, eight hours rest” idea. However, should the standards of the previous century be applied to the modern working life? The 8 hour workday still raises questions for many, especially for those familiar with the research that suggests that this standard is neither efficient, nor productive. 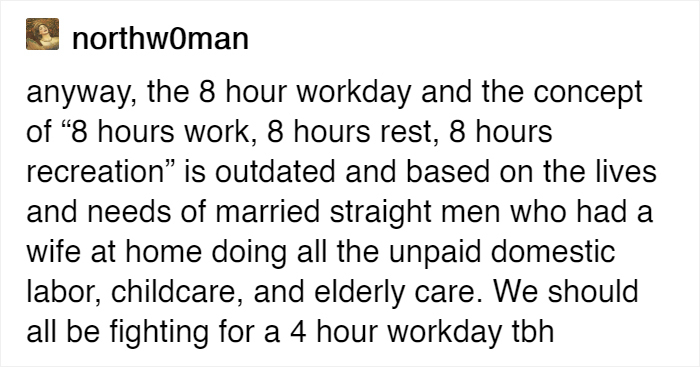 One Tumblr user, who has named themselves northw0man, has started a discussion on the social platform, suggesting that we should reconsider the standard working time. Other person jumped into the topic too, providing with a link of a recent research about the link between productivity and working time. The research points out a significant finding: the average worker, who works 8 hours a day, is only productive for 2 hours and 53 minutes. While evaluating nearly 2,000 office employees, the study has also revealed that for most of the time they’re at work, people aren’t working. Surprising? The researchers then lay out, that more than 1 hour is spent on reading news, checking social media takes about 44 minutes and talking with co-workers about non-work-related topics, takes up about 40 minutes of time. Searching for new jobs, smoking breaks, making calls, hot drinks, texting, eating and making food also accumulates for a lot of lost time. 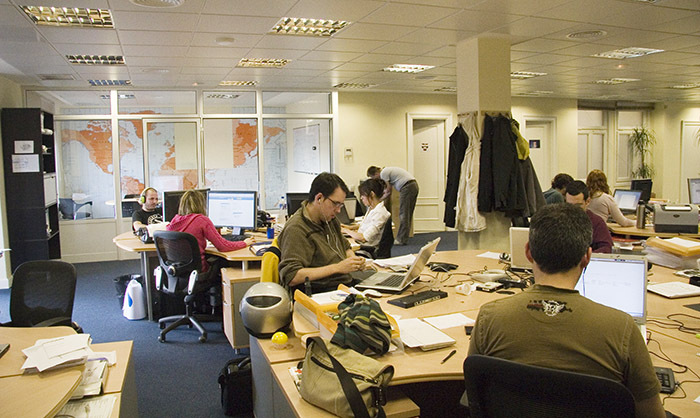 Therefore, it may be implied that the majority of time spent in the office is unproductive. If we take away all of the unproductive time from 8 hours, only 4 are left. The user named thesnarkbait also brought their two cents on the topic, mentioning the research done in Gothenburg, Sweden. 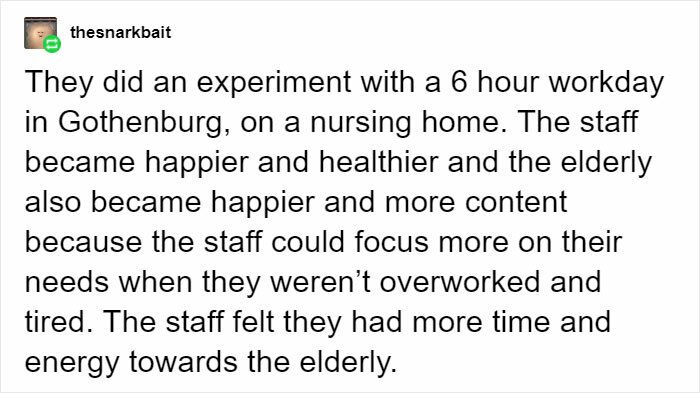 It pointed out that the nurses that participated in a 6-hour workday for the research, showed improved productivity, indicated improved work–life balance and even their patients noticed a boost in quality of care. However, it seems as if employers are not very keen on acquiring the new, suggested standards. What do you think? Should we strive for shorter working hours? After all, it seems as if it’d be definitely a win-win situation, both for the employer and employee.